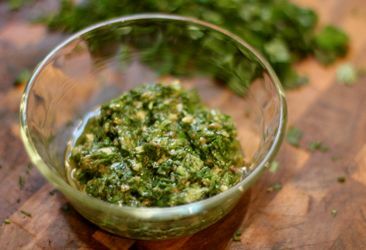 Add the green garlic and a pinch of salt to a mortar and pestle, blender, or food processor and mash it into a paste. The salt helps to breakdown the green garlic when you are mashing it. When it is the consistency of a fine paste, add the pinch of chile flakes and lemon juice. The lemon juice helps to activate the garlic and draw out the flavors. Let the paste stand for a few minutes. Fold in your herbs, mix thoroughly, and then top off with the olive oil. The oil is an approximation; you can make the salsa as dry (less oil) or as wet (more oil) as you want, depending on your preference. If this is a simple dip for bread or veggies, go for a wetter version. If this is a topping for a fish or meat dish, go for a drier version. You can also riff off this base recipe by adding chopped egg, olives, capers, anchovies, horseradish, and other herbs. Serve with crudités, over meat, with eggs, and so on.